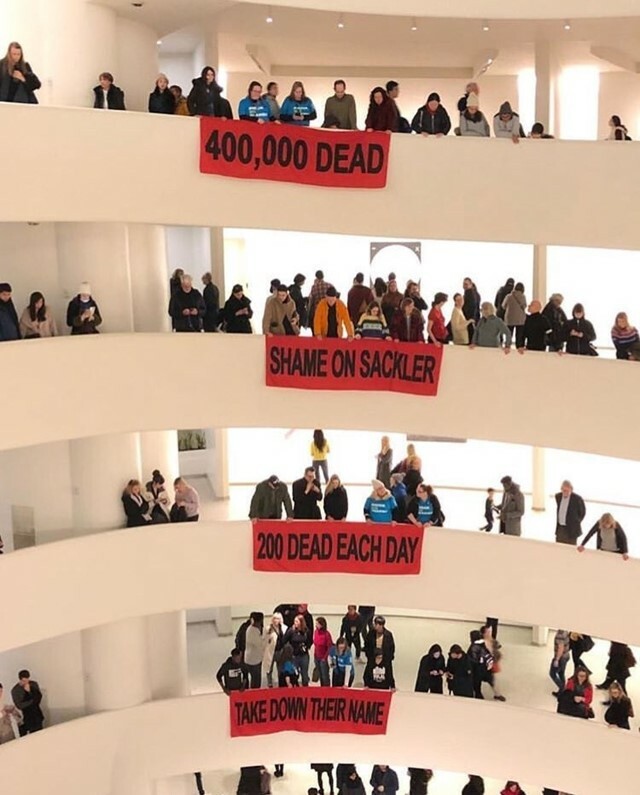 On Saturday (February 9), artist and P.A.I.N founder Nan Goldin led an anti-Sackler demonstration at two of New York’s leading museums, the Guggenheim and the Met. It followed an open invitation via Instagram, calling for members of the public to “Meet me on the steps!”. Crowds of people turned up to criticise the museums’ continual acceptance of Sackler donations. The family’s pharmaceutical company, Purdue Pharma, is one of the largest manufacturers of Oxycontin, the drug at the crux of the opioid crisis, in the US. Goldin’s organisation is calling for the Sackler family to channel their earnings into the treatment and care of victims of the painkiller addiction. Despite the Sacklers’ accountability in the drug crisis – and the 200,000 deaths caused by it since 1996 – the Met still has its Sackler Wing, and Guggenheim’s Sackler Centre for Arts Education, a gift from Mortimer Sackler, has kept its original name. The activist collective has condemned the lack of direct action by the art world’s biggest institutions, and has consistently railed against any complicity in various protests and die-ins. Saturday’s protest kicked off in the Guggenheim lobby, where a die-in was staged, banners were erected and fake prescriptions were scattered. Later, on the steps on the Met, the group chanted “Shame on Sackler” and held posters demanding that the targeted institutions “TAKE DOWN THEIR NAME”.